As an insolvent University of Mississippi student, one of my fondest memories was Friday afternoons when a battered truck would arrive at my favorite Oxford bar, disgorging a load of fifty-cent oysters fresh from the Gulf (the perfect complement to fifty cent beer). My friends and I would stake out a booth and wait for the oyster shucker to work his magic before presenting a tray of gleaming split oysters hunkered down in a bed of white ice. These days—though far from the ocean—I needn’t wait for a battered oyster truck—or for Friday. While oysters appear daily in various forms on the menus of countless Midwestern restaurants, not one of these marvelous-tasting mollusks is remotely native. So how is it that these fragile marine savories appear in fresh and flavorful form on all of these heartland tables? The story begins at the approach of the 20th century with the establishment of the city’s first oyster restaurant, the Rector House, which acquired oysters from a Long Island Sound supplier whose name became synonymous with high-quality oysters around the country—the Blue Point Oyster Company. Eventually, the waters of Long Island Sound could no longer support oyster beds; however, the Blue Point name stuck and is currently used to describe oysters reminiscent of those originally supplied by Blue Point. Chicagoans developed a taste for the plump and firm ocean goodies as oyster farms sprouted up and down the eastern and western coastlines. Flash forward nearly a century to the establishment of Shaw’s Crab House in 1984. Shaw’s is ground zero for oysters in the Midwest, and one of the principal purveyors of the mollusks in the country. As this urban institution nears its 20th anniversary, its oyster sales are approaching the eight million mark—nearly an oyster for each resident of the Chicago area. Going directly to the source, I contacted Tod Barber, Shaw’s partner and oyster enthusiast. Barber and his partners man the helm of one of the most successful seafood restaurants in the world—and this more than a thousand miles from the nearest salt water. During our hour-long conversation, he reveals a passion for oysters nearly as deep and swirling as the sea in which his beloved oysters are found. When asked to explain the popularity of oysters in Chicago, Barber provides the conventional explanation that oysters are plump, meaty morsels with a distinctive, salty flavor that no other seafood can duplicate. However, when he responds to a question about why he enjoys the oyster business in Chicago, his reply is less predictable. Other tricks exist to ensure that oysters endure their long flights as pristine as the moment they were roused from their briny little seabeds. In order to prevent their essential freshness and flavor-preserving juices (a/k/a liquor) from escaping, oysters must be transported on their backs—never on their sides. While these layers of mindless mollusks aren’t demanding massages or an in-flight movie, they do require a little extra leg—er, shell room. If Shaw’s relies on oysters from the northern oceans, Heaven on Seven’s Jimmy Bannos looks south to the generations’ old farms of Louisiana. New Orleans oyster supplier Val Sevin works primarily with small-time farmers whose harvest goes from a Louisiana bed to a Heaven on Seven table overnight—not bad for a leg-less, wing-less mollusk. Sevin—like Shaw’s Barber—credits O’Hare and FedEx for this amazing feat. Davis Street Fishmarket in Evanston also acquires its oysters from across the world. Sporting one of the largest after-work oyster bars in the region, Davis Street’s busy crew of oyster shuckers recently prepared 210 of the specimens for one diner who polished them off in just over an hour. Thanks to the wonder of overnight delivery, though, the restaurant’s stocks were replenished within a day. There’s a myth to match many unusual foods, and oysters are no exception. While I won’t attempt to dispel their legendary aphrodisiac qualities, I don’t mind discrediting the culinary myth that the shellfish should be eaten only in months with an “R” in them, effectively barring the summer months when split oysters beckon invitingly from a bed of ice. From May to August, when ocean waters warm and oysters spawn, the mollusks turn soft and creamy—instead of being firm—and restaurants and suppliers begin looking for oysters from cooler, northern waters. But you needn’t eschew an oyster just because summer has made its reluctant return to the Midwest. While the most popular preparations for oysters are raw on the half shell and Rockefeller, other preparations are creeping onto restaurant menus. Randolph Street sushi salon Starfish features a fresh oyster in sake ponzu sauce served with a quail egg, while Shaw’s offers its highly edible oyster biscuits (see recipe below). Further afield, Wicker Park’s Zen parlor Ohba offers a caviar-crowned oyster bathed in a tomato sake broth and served on a bed of seaweed while multi-starred Tru features a chilled sunchoke velouté with curried oyster. On occasion I miss my carefree school days when fifty cent beers and fifty cent oysters rounded out a week’s simple existence. 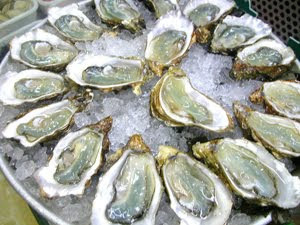 But then I can’t help feeling pity for anyone, anywhere, who can’t get a fresh oyster any day of the week. And like Tod Barber and Val Sevin, I thank God for O’Hare and its oyster pipeline. Sift together dry ingredients. Add ½ cup of Jarlsberg. Add whipping cream until just combined. Let dough sit 15 minutes before rolling. Roll to 1/8" thickness. Cut 48 2½" pieces with a cookie cutter. Place a dab of spinach and cheese on each biscuit and top with an oyster. Seal with top layer of biscuit, brush with cream and sprinkle with fennel seeds. Bake at 375 degrees for 15 minutes. We'll have to make a trek to Davis Street! Also, you should check out Dirk's Seafood on Clybourn. Perhaps the freshest fish in the city (for a price). Oh, yeah, I'm familiar with Dirk's. We have bought giant whole fish there before. Super tasty, if pricey. But worth it.